Prince Charles, his jersey soaked with sweat and his britches covered with mud, slowly walked to the awards platform before a cheering throng of 12,000 at the Palm Beach Polo and Country Club in Wellington. His Palm Beach team defeated the All-Stars 11-10 in an exhibition polo match Tuesday at Wellington, but it wasn’t easy. His Royal Highness took a polo ball on the shoulder blade from an errant shot and nearly toppled off his polo pony twice when he loosened his grip on the reins. 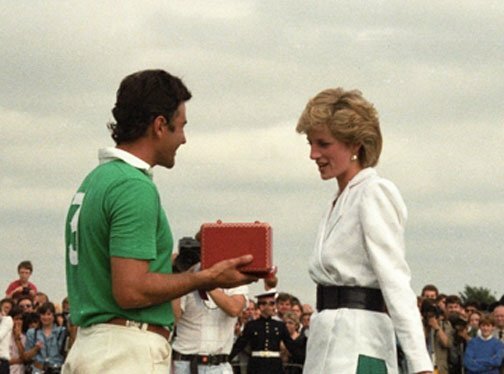 Princess Diana presented Gracida with the porcelain-and-silver Princess of Wales Trophy. She then rewarded her husband with a porcelain polo pony and a kiss. Gracida has spent the past three summers in England playing polo with Charles’ Les Diables Bleus team. The two play well together. Gracida and Charles have worked out signals where Gracida will touch the top of his gold helmet when he has open field and a chance at scoring. Prince Charles played the No. 4 or back (defensive) position. He is rated at four goals. He started off slowly, but picked up late in the first half. He needed time to adjust to the horses loaned to him by teammates William T. Ylvisaker, Geoffrey Kent, Gracida and opposing player Kenneth McLean. When Prince Charles was hit in the shoulder blade with a ball in the first half, he smiled and turned to Kent. Gracida and Kent, co-sponsor of the Rolex Abercrombie & Kent polo team, each scored five goals. Prince Charles scored the other goal on a 20-yard penalty shot with 2:48 remaining in the third chukker. Ruben Gracida and Allan Scherer each had four goals for the All- Stars. The crowd quickly got involved, cheering for the prince every time he had a good shot. As Princess Diana watched from the Royal Box, McLean closely marked Prince Charles in the first half. “Nice shot, sir,” was the line of the day from both his teammates and opponents. There were no special allowances made for Prince Charles – only the opportunity to score the penalty shot. The highest-ranked player takes most penalty shots. “Of course, I called fouls on the prince,” said Rob Walton, who officiated the game along with Clark Hetherington.